Earnings results are, over the long-term, the most fundamental factors behind a stock’s performance. That said, for some companies, certain quarters are more noteworthy than others. With earnings season in full swing, it is an impossible task for most to track every release. If investors pay attention to only five earnings releases next week, they should be those from: Caterpillar Inc. (NYSE:CAT), Apple Inc. (NASDAQ:AAPL), Zynga Inc (NASDAQ:ZNGA), Coinstar, Inc. (NASDAQ:CSTR) and Deckers Outdoor Corp (NASDAQ:DECK). Caterpillar Inc. (NYSE:CAT) is a maker of heavy machinery, but more fundamentally, a play on global growth. Spending on infrastructure fuels most of the company’s business, which is why Caterpillar — unlike other companies — typically gives its expectations for the global economy in the coming years. More specifically, Caterpillar is heavily exposed to China. 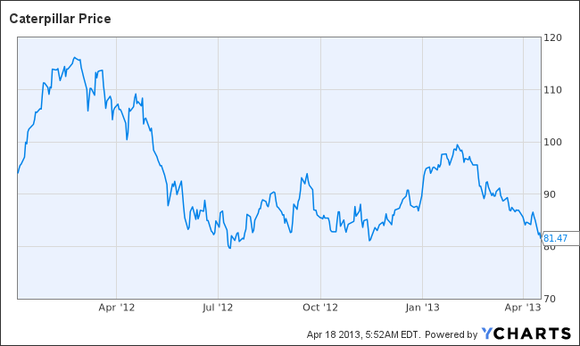 Shares were trading above $100 last winter, but are down nearly 30%, perhaps on fears of a Chinese economic slowdown. Recent Chinese economic data has been poor, notably first-quarter GDP growth. As China’s economy continues to expand, it remains one the largest buyers of commodities, particularly on the margin. Investors should pay attention to what Caterpillar has to say about China’s economy, as it could have significant consequences for all commodity names. On the last earnings call, Caterpillar’s management said that it expected economic improvement in China this year. It will be interesting to see if they reiterate those comments, or change their tune. 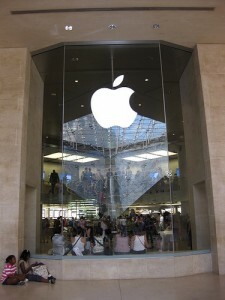 Apple Inc. (NASDAQ:AAPL) will report Tuesday, and all eyes will be on the Cupertino tech giant. After dropping roughly 40% from the high hit last September, investors will be looking to see if the company can do something to reverse the slide. Apple Inc. (NASDAQ:AAPL) remains reliant on the iPhone for the majority of its profit; with more competitors emerging than ever before, has iPhone demand held up over the quarter? Or is the iPhone losing ground to its Android-powered rivals? Even more pressing will be talk of potential capital returns. Apple Inc. (NASDAQ:AAPL) is currently sitting on about $140 billion worth of cash, and plenty of investors are eager to see the company return that money to shareholders. Investors should watch Apple Inc. (NASDAQ:AAPL)’s earnings release for any talk of capital returns — through an increased dividend, or expanded share repurchase program. Either undertaking could send shares sharply higher, while a total avoidance of the issue could have a devastating effect on Apple Inc. (NASDAQ:AAPL)’s shares.